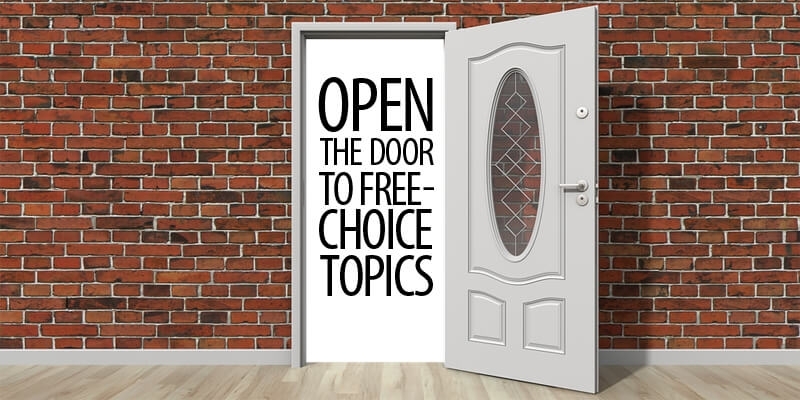 Free-choice writing can be difficult if students don't know what to write about. Consider some of these grade-level suggestions to support topic generation. Without the element of choice, the joy of writing, like the joy of reading, could suffer a terrible fate. "Readicide," according to Kelly Gallagher, is "the systematic killing of the love of reading..." Gallagher's book, Readicide, focuses on the negative, forced reading practices found in some schools. Picture files--Put up a picture on flip-chart paper and do a class list of possible topics from that one picture. Show and Tell and Beyond--After a student shares, ask students to brainstorm topic ideas triggered by the shared item. Post the ideas on another flip-chart page. Expert Lists--Ask students to make lists of what they know a lot about. Kristina Smekens shares this idea in Launching the Writer's Workshop: Grades K-2 and Grades 3-12. Silent Field Trips--Take your class on a quiet journey through the school or outside to gather topic possibilities. Window Watchers--Ask students to list everything they see or imagine as they look out (or at) a window for two minutes. What do you care about?--Provide some discussion time for peers to make lists of things that really matter to them (e.g., social issues, friendships, school or local problems, etc.). Let them talk and list in pairs or trios. Consider allowing a little free-choice writing within the otherwise assigned writing. Free choice can freeing and refreshing. Sometimes it frees up a child who might otherwise remain sealed and silent.